Timesheet is an app to record your working day (i.e. 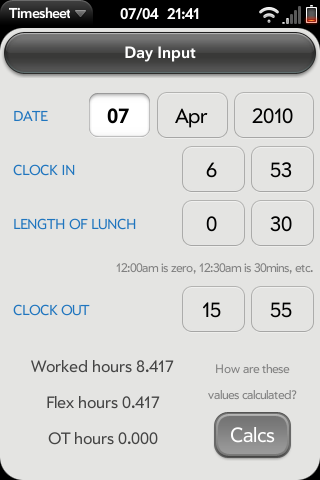 clock in time, lunch break and clock out time) and Calculates your hours worked, flexi time for the day and overtime. The Month View then shows the total hours, flex and overtime worked so far this month (up until the previous day) and you also have the option to look at previous months total hours. There are three options to export the month view data to an email, csv decimal, html decimal & html hours. This app has been designed to be used with the 24h clock. This app is now configurable to hopefully everyone's working week( may be not everyone ). Set up your working week in the Preferences screens, one for each day of the week. Every day can be different. Core Hours is when you start and finish your normal working day. Overtime is extra hours added on at the end of the working day, so set when your overtime finishes. If you don't get overtime simply set the overtime to the same value as the finish of your core hours and no overtime will be calculated. Like wise if one of the days you work is purely overtime and no core hours are built up set the start and finish of the core hours to the same value and set when overtime finishes. Default Times allows you to set the default start and finish times for each day so that you don't need to scroll through all the hours from what ever I set it to i.e. 0:00.